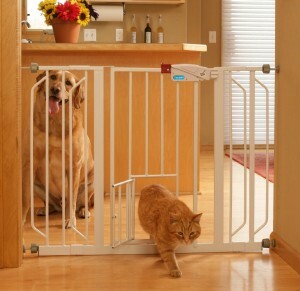 For all those animal lovers out there, who usually have an array of pets trailing you in your home, now comes the perfect pet-safety gate that can meet the needs of all your animal, the bigger ones as well as the small ones – the Carlson 0930PW Extra-wide Walk-thru gate (with pet door!). If you need that one safety gate in the house that can guarantee the safety of your bigger and smaller pets, as well as your toddlers and infants, then this is the one gate that you need! The most unique feature of this safety gate is the small pet door for your smaller pets. This pet door is just the size to keep the way of communication open for your small cats, but keep your infant and your bigger pets safely confined where you want them to be. The Carlson 0930PW is made of steel and is sturdy and secured, while being light and manageable at the same time. It gives you a secured pressure-mount system technique of fitting, that can be used in any room in the house, the stairways and the main doors, even between furniture. The gate can be opened with only a slight touch of the hand, which makes it easier for you to move around them, but impossible for your pets and infants. The material is sturdy and 100% lead-free, making it safe for pets and children alike. It is also chew proof and non-toxic, which adds an extra bonus for all your naughty pets. 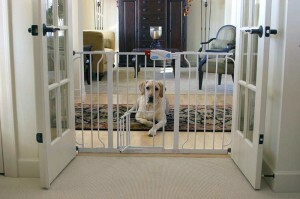 The Carlson Extra-wide walk-thru safety gate is 30 inches in height and fits an opening of 29 to 44 inches. The small door in the gate is 10X7 inches in measurement and the perfect size for your smaller animals. This is the perfect safety gate for families with numerous pets of different ages and sizes, as well as toddlers who has a nose for adventure. The gate comes with easy-to-install options and 2 extensions that give the gate the ability to expand to 44 inches, perfect for wide areas. Four secured and sturdy pressure mounts allow a trouble-free installation that is easy and can be done in a matter of minutes. The steel construction is sturdy enough for bigger and stronger animals. The small door will give your smaller animals to roam around the house, while the bigger ones would remain confined to your preferred areas. The Carlson 0930PW only offers a pressure-mount installation technique which makes it a little risky to install it around the stairways and pools, especially in a house containing big animals and children. Also, the small gate provided for smaller animals is big enough for some medium-sized animals to pass through. The Carlson Extra-wide Pet gate is rated 4.3 stars out of 5.00 and costs around $38.34. Despite it’s some limitations, this safety gate is still an extremely thoughtful and practical gate for a house that has numerous pets as well as children who need protection.